Ramakrishna Mission Students Home, Chennai wanted to install a solar thermal system to reduce their dependence and incremental expenditure on LPG used for cooking. 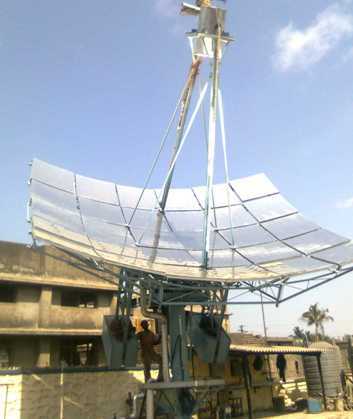 1 ARUN®100 solar thermal concentrator with energy storage arrangement generating 540 kg of steam/day during solar hours on a clear sunny day, satisfying the complete energy requirement for cooking and hot water, resulting in 100% LPG fuel saving of 30 - 40 kg per day (depending on the usage). The system was commissioned on 26thOctober 2013. Steam available round the clock though provision given for energy storage. Steam Storage has been provided for cooking breakfast at 4 a.m. 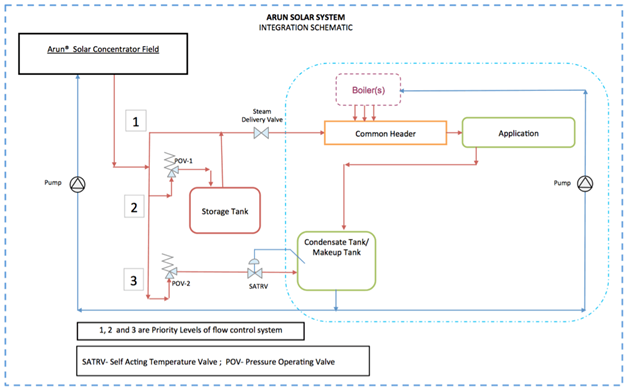 The basic aim of the control system in this integration scheme is to deliver steam to the existing boiler header and excess steam to be delivered to thermal storage for non-solar hours operation. 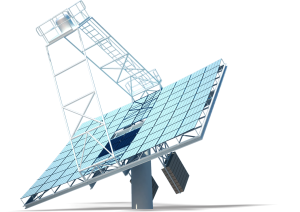 The ARUN dish automatically tracks the sun from morning to evening. The receiver coil at the focus of the dish transfers the heat of the sun to the heat transfer medium (water). “The Steam generation system with Storage” consists of ARUN®100 dish, thermal storage, pumps, valves, etc. Once the system starts generating steam and required pressure is achieved, the steam is delivered to the common header of existing boiler system. If there is reduction in steam usage by the process (due to holiday, break, etc), the upstream pressure increases causing a valve to open, thereby delivering steam to the storage tank. This process continues whenever the sun is available. When the sun is not available, steam is first generated from the storage tank. Thereafter the existing boiler system is turned on. Footprint Area 3m x 3m = 9 sq.m. A typical energy requirement in community cooking setting is shown in the graph below in blue line. The red curve shows the energy generation with solar system. 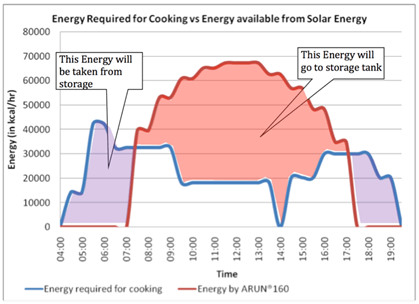 It is seen from the above graph that there is a mismatch in timings between the cooking energy demand and solar energy supply. The red shaded area (solar energy delivered in excess of requirement) is stored in a thermal storage tank. It is used at times when solar energy is not available for the cooking requirement (blue shaded area).